The games of Round 8 started in Tyumen several minutes ago.The leaders are playing on the first two boards: Vitiugov - Dubov, Andreikin - Sjugiriv. You can follow these and other games live. The opening part of the games is played right now in the Premier League of the Russian Championship held in Tyumen. The players are back to the boards after the only free day at the competition. 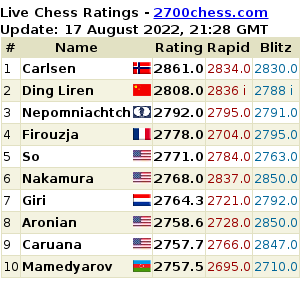 The sole leader Daniil Dubov faces Dmitry Andreikin, who at the moment is the nearest rival of a 16-year-old GM. You can watch this and other games of Round 7 live. The ninth round games of the Premier League of the Russian Championship have started in Tyumen. Daniil Dubov, who was leading throughout, is playing with white against Dmitry Bocharov. The duel of the nearest rivals is between Sjugirov and Vitiugov. You can watch these and other games live. The Premier League of the Russian Championship is nearing the end. The games of the penultimate, tenth round have started in Tyumen. We remind you that the key fight is for five places in the Super Final. You can watch the games live. The fourth round games of the Premier League of the Russian Championship have started in Tyumen. There' only one participant remaining with the 100% score: Daniil Dubov. Today he's playing against Sanan Sjugirov with black. All games from the group of the nearest rivals are also interesting. You can watch the games live. The 5th round games of the Premier League of the Russian Championship have started in Tyumen at 13:00 MSK Time. Daniil Dubov maintains sole lead and faces Ivan Popov with White. You can follow the games live. Round 2 games of the Men's Superfinal have started several minutes ago in Radisson Slavyanskaya, Moscow. Follow the games live. The 4th round games of the Men's and Women's Superfinals have started in Radisson Slavyanskaya, Moscow. The leaders face each other in the men's section: Alekseev - Andreikin. In all other encounters the nearest rivals of the leaders have chance to catch two "A"-s. Follow the games live. Our correspondent Elena Klimets is working on the spot. The last round games of the Premier League of the Russian Championship have started in Tyumen. The fight is for the top five places, which guarantee entry into the Super Final in August. You can watch the games live. Third round games of the Men's and Women's Superfinals have started several minutes ago in Moscow. Our correspondent Elena Klimets is on the spot. Follow the news on our website. the participants of men's and women's Superfinals have just started the 7th round games. 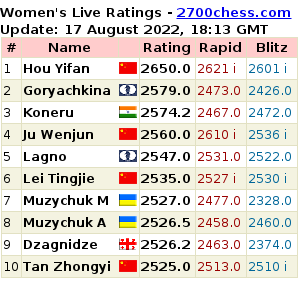 In men's section Grischuk and Karjakin will be white against the leaders - Andreikin and Alekseev respectively. the duel of the leaders is also under way in the women's section: Girya - Pogonina. Watch these and other games of the round live. Follow the latest news on our website, our correspondent Elena Klimets is working on the spot.